The very talented Kate Gilbert originally wrote the pattern for Anouk as pinafore, open on both sides but held together by cute button sidebands. This was a great design that allowed for a garment that would grow as a baby grows. When I decided to make this pattern I realized that I was way too lazy to knit both pieces. I am a very lazy knitter, usually opting to take the quick and fast way out of any pattern. 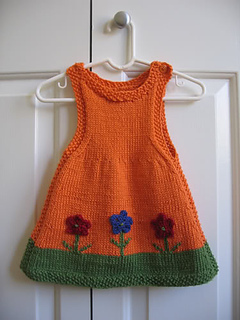 Therefore I turned the pinafore into a dress, allowing me to knit the skirt part completely in the round, only having to knit flat for the front and back bodice. Then as I went to knit the pockets, as in Kate’s original pattern, I realized that I am not a fan of intarsia and looked for any which way to get out of it. I wanted to do something other than pockets so I came up with using duplicate stitching for the flower stems and leaves, and then created 3D flowers to sew on at the end. I used the same shaping as Kate’s original pattern modifying only the basic concept from a pinafore to a dress, the actual colors, and the pockets (or lack there of in my version). I just want to thank Kate for giving me permission to re-write this pattern using my modifications to turn it into a dress. Without Kate’s fantastic pattern to start with, this dress wouldn’t be nearly as cute! I used the same information from the original pattern where possible to keep things consistent for those of you who are used to the original.